Memorial: Dawlish Memorial Inscription CARMAN W. SGT-MAJ DEVON REGT. Wilfred joined the Territorials in March 1908.In 1908, when the Volunteers became part of the newly formed Territorial Army, two longstanding Devon volunteer units merged to form the 5th (Territorial Force) Battalion of the Devonshire Regiment. Based on Plymouth, the 5th recruited from the south-west of the county. The outbreak of war found them at their annual camp on Woodbury Common, Exeter. The 1/5th were sent to India in October 1914. They spent two years at Multan, supplying drafts to units in operational theatres, including 50 men who in 1915 were sent to join the 2nd Dorsets at Kut el Amara. In March 1917 they left for Egypt and early May found them at El Arish. In June they crossed into Palestine, where the newly-appointed General Allenby was planning how to capture Jerusalem by Christmas. In May 1918 the 1/5th were ordered to France where they fought on the Marne. Capturing the village of Bligney on 28th July took a toll of 388 killed and wounded. In June 1918 the 1st/5th Battalion was at Fonquevillers, a village about 18 km south west of Arras. 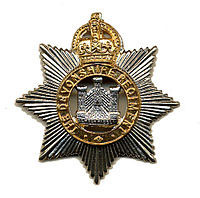 The War Diary shows that it was relieved on the night of 18/19 June and moved to the area occupied by the forward battalion of the Res.Bde relieving the 2/4th Kings Own Yorkshire Light Infantry. The reports do not give names of other ranks, only those of officers killed or wounded. Company Sergeant Major Wilfred Carman was one of three killed by a shell-burst on the 20th June. The extract from the Dawlish Gazette records the incident and carries a tribute from his company officer, Captain Arthur G W Church (q.v.) who was to die in action himself only a few weeks later. He said that C.S.M. Carman was an upright and gallant soldier, and a faithful and loyal friend. He had been on continuous service without home leave since 1914. Wilfred Carman was the son of Robert Burton Carman (1853-1931) and Harriet (nee Snell)(1855-1917). They were married in 1884 and Robert was a groom/coachman living in Fore Street, Chudleigh in 1891. Robert Burton Carman was born in 1853 in East Carleton, Norfolk (close by Norwich) to Mark (1820- ) and Sarah Carman (1821- ). Harriet Ann Snell was born in Chudleigh in 1856 to Simon (1805-1883) and Eliza Snell (1818-1893). The Snell family were residents of Chudleigh for most of the 19th century. By 1901 Robert and Harriet had moved to Dawlish Lodge, Mamhead where Robert was still employed as a groom. In 1911 they were living at Alma House, Luscombe Terrace, Dawlish and Robert was still employed as a groom. They had lost one child out of five born before this date, and Wilfred was working as a carpenter and cabinet maker while his sisters Hilda, 23, and Norenie, 18, were unmarried. Wilfred joined the Territorials in March 1908 and became a proficient soldier to reach the rank of Sergeant in charge of the Dawlish Detachment by the outbreak of war. Letter commending the Devonshire Regiment on the Marne.